Five Arctic tourism organizations have joined forces to develop guidelines for tourists visiting Arctic communities. In addition to general advice on how to behave, the organizations presented a tool that allows communities create their own tailored guidelines. 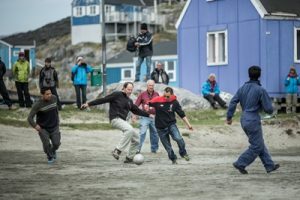 A game of soccer between cruise guests and Itilleq locals in Greenland. Photo by Mads Pihl / Visit Greenland. In April, the Association of Arctic Expedition Cruise Operators (AECO), Visit Greenland, Cruise Iceland, Visit Svalbard and the Northern Norway Tourist Board presented a set of Community Guidelines aimed at Arctic tourists. The guidelines, which provide travelers with useful dos and don’ts when visiting Arctic communities, have been developed with the input of local stakeholders. In addition to general advice, the tool includes a template that Arctic towns and hamlets can use to establish guidelines specific to their own community. Frigg Jørgensen, Executive Director of AECO, hopes that the new tool can be a resource for everyone who wants Arctic tourism to leave a positive footprint. – We are working to promote sustainable tourism in the Arctic, and social and cultural interactions between visitors and locals are an important part of that. We know that many Arctic communities welcome the economic opportunities associated with increased tourism. We want to educate tourists and tour operators on how they can make sure that their visit benefits the local community, says Ms. Jørgensen. The guidelines include pointers on everything from cultural considerations to recommendations on what kind of souvenirs to buy. Anders la Cour Vahl, Deputy Director of Visit Greenland, underlines that one of the goals of the project is to make it easier for communities to share their knowledge with tour operators. – Ultimately, it is the local communities in cooperation with tour operators that are best placed to advise tourists on what they should and shouldn’t do. We are excited to present a template that can be used to create Community Specific Guidelines. The template is a starting point for communities that want to work with tour operators to educate visitors on how they can make a positive impact. Using a common format will make it easier for tourists and operators to quickly understand what they should keep in mind in each place they visit, Mr. la Cour Vahl says. The project is funded by the Nordic Fund, and the Community Guidelines and template for Community Specific Guidelines are available from all partners in the project.